As I continue my way through The Sentinel, I will give readers a chance to enjoy another author interview. I have really enjoyed being a part of this author's journey and hope you readers are trying out some of the books I have reviewed and recommended. We are back with Anna Kashina again for some more fun interviewing. This time about her amazing new action adventure novel Blades of the Old Empire. Her new novel has been in stores for six days and has already entered the top 100 in the World Literature category. That is a strong opening for a strong book. Amy) To me, it seems that every classic adventure fantasy has a great map. How did you develop the map for Blades of the Old Empire? Anna) This map was developed in stages. First, I started with an overall sketch of my world. I aimed for an enclosed area equivalent to or slightly larger than Europe, because that, for me, made for a manageable setting for a series. To make it enclosed, I surrounded it with oceans on the west and the south, and mountains on the north and the east. Of course there are kingdoms that lie beyond these mountains and oceans—and they may surface later in the series—but at least this gave me a correctly sized world for what I had in mind. I populated it with cultures I wanted to have in my story, a desert Arabian kingdom in the south, a nomadic area in the east, Slavic-type people in the center, northern warriors, and others. The next level of detail came when I started working on the story. When the characters traveled somewhere or mentioned a place, I put this place on the map to have a reference point. I was working with a horrible hand-drawn sketch, but it served the purpose. Putting places on the map added authenticity to the writing, in my mind they became real places and I could then build up their culture, history, etc. I am a visual writer, and I always have a very detailed view of every scene in my mind. Having a map helped me anchor these scenes into a “real” world. In “Blades of the Old Empire” people travel long distance, and at some point in the story there is a race between two groups of characters trying to get to the same spot at the same time from two vastly different destinations. When I wrote this, my map work came down to details, laying out roads and trails, measuring distances, devising means for people to cover these distances in the same amount of time by using different mounts and transportation means. It had to be timed to the minute, and it did work out well. I submitted a roughly sketched map to my publisher after signing the contract. When they told me they are commissioning an artist to draw the map for the book, I was thrilled. But the highlight of it came when I actually saw sketches and got to give feedback on them. The map artist was amazing in his knowledge of geography and the fine aspects of map drawing for fantasy books. At some point we were e-mailing each other all day to polish the details. When I saw the finished map I felt very gratified. It gave an additional anchor to my world, made it even more real in my mind. Amy) Each character seems to bring a certain "magical" strength with them. How do you keep all the details of your magic system organized? Do you develop it in advance of writing, or as does it develop as the characters get written? Anna) A little bit of both, I think. Generally I believe it makes for a much clearer story if each character has a defined magic skill, with its strengths and limitations, so that this character can win or lose depending on the situation and the opponents’ strengths or weaknesses. I actually studied some role-playing games to see how this works, and it helped me to some extent to set the boundaries. Even with all this planning, many things about my characters’ magic came as a surprise. Kythar’s gift was very challenging to write. His overall strength is focus, an ability to either focus an external power (e.g., the wind) to aid him, or to focus his mind. This protects him against his enemies’ mind control magic, which works exactly the opposite: de-focusing the opponent’s mind, making people lose concentration to the point that it becomes physically debilitating. But to convey it clearly to the readers and to define the boundaries was hard. An additional difficulty came from the fact that Kythar is just learning to use his magic, and he is the main point of view character, so when we are in his mind we don’t even know for sure what he can do until he tries it and either succeeds or fails. His magic developed in parallel with the Kaddim’s when I wrote the story. And then there is Ellah’s gift of truthsense. This was an easy one to define, but it came as a surprise to me. Ellah is a headstrong girl who often rubs people the wrong way because of having opinions about everything. She is not particularly good-looking and is the essence of what we think of as a “normal” person. When it is first brought up that she has magic, Ellah’s first reaction is “no way!”, and so was mine. But then, as she started learning to use it, it fell into place perfectly. I realized (and she did too) that she is opinionated exactly because she sees the truth where others don’t, even if up to a certain point she is not aware of it. It made her magic so clear in my mind and in the end I think it also made her one of the strongest characters in the book. In a way, the Majat’s ability to fight is like magic too, strength and speed far beyond that of a regular person, and I am exploring this notion further in book 3 of the series. 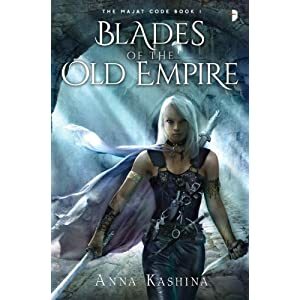 When I wrote “Blades of the Old Empire”, I got so tuned in to each character that I did not have to make a conscious effort to keep track of the details. It just worked. Amy) You have the peoples of Cha'ori, Illitand/Dorn, ShayilYara, and Forestlands romping around the story. What inspired the diversity of your characters? Anna) I find the societies that blend distinct influences from different cultures very interesting. On one hand it provides for hidden tension and conflict, which are the cornerstone elements of suspense. On the other hand, aspects of different cultures add authenticity, color, and depth. To me this whole book is about blending diverse cultures: eastern style of fighting in a western medieval setting, matriarchal elements in an intrinsically patriarchal society, etc. Some of these things are not even visible, but I think they feed both the visual aspects of my book and the fun of it. Amy) I am really hoping we get to learn more about the separation of the Keepers and the Kaddim. They seem like they have a shared history. Will their story be further developed in the forthcoming novels? Anna) I definitely hope so. Some of it is glimpsed into in book 3, the as-yet-unnamed sequel to “The Guild of Assassins” I am currently working on. Going into greater detail would, of course, require going about 500 years back in history. I do have a novel planned out, which is set all the way back then (actually my currently available short story, “The Majat Testing” is a direct prequel to that novel and features some of the same main characters). This planned novel will hopefully address many of the questions posed in the current book. How and why did anti-magic laws come into place? What happened to the old empire? What are the roots of the Order of Keepers, the Kaddim, and Ayalla the Forest Woman? Of course this book would have a different set of main characters, since it is happening so far back in time, but some of the secondary characters, the slow-aging ones, will be around. I hope the Majat Code series will be successful enough to enable me to write and publish that book. You can learn more about Anna's works from her website, www.annakashina.com . Connect with Anna through Facebook and Twitter. Her next Majat Code novel, Guild of Assassins, will be coming to stores in July.